I finished a new painting in my Fae and Nature series: STORM. Storm, 16″ x 20″, acrylic on canvas. 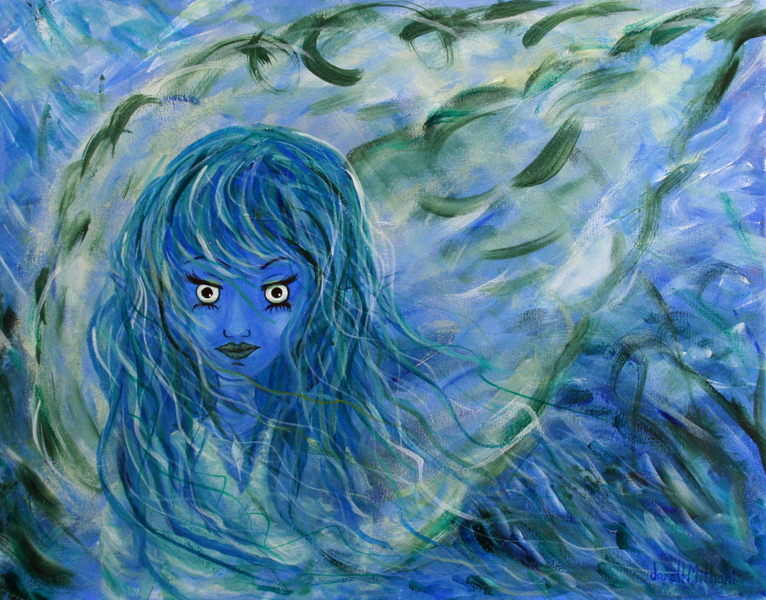 This entry was posted in Art, Art and Women, Janell's Artwork and tagged fairy, Manga, painting, storm, wind. Bookmark the permalink. the color of this painting brings so much joy! Awesome Janell! Love the flow of lines and colors. I like the representation how her face shows up in the cloud which is usually blown from the mouth of a face representing storm and wind! Love the color scheme and my favorite part of your painting has to be her eyes! Now that is absolutely gorgeous! I must mention her hair too, your brush strokes superbly placed every single hair strand on the right spot, love the balance of the dark and highlighted strands. She is beautiful just as the whole painting! Eva, thanks so much for your comments. I so appreciate them. THERE CERTAINLY IS FAE IN THE EYES OF THIS STORM! Reminds me of The Furies. Again, great movement in the strokes. The blue looks stunning as well. I am sure you will have a handle on it soon. I am just now getting used to commenting and posting from the app on my phone. Yes.I’m using my phone too!